What is the current status of Brazil’s Startup scene? Is it still booming, or has it lost its momentum? There are credible people with strong opinions on both sides of the spectrum. Most optimists, like Indian-American tech entrepreneur and academic Vivek Wadhwa, predict that some Zuckerbergs will emerge from the slums of Sao Paulo before the end of this decade. On the other hand, pessimists like French investor Fabrice Grinda believe that unless structural changes take place, especially in the legal and tax system, only a few tech entrepreneurs will manage to thrive in Brazil. – According to comScore (2013), consumers in Brazil spend more than 27 hours per month online on their computers (global average: 24.7 per month). –23.3% of Brazilians use their phones to access the internet. As of mid-2013, Brazil was home to the largest mobile phone market in Latin America. Reuters forecasts that Brazil will become the fifth largest smartphone market in the world by the end of 2013. – Mobile phones and tablets are becoming more important to the Brazilian internet landscape. Page views from Non-PC devices (i.e. smartphones and tablets) have reached an all-time high at nearly 6 percent. (Source: comScore Device Essentials). – 13% of Brazilians use their phones to compare prices while visiting shopping stores in person and 24% of Brazilians surf the web while watching TV (Source: McKinsey Study: Brazil’s e-psyche: Grasping trends in an elusive market). – According to official data from Brazilian association of Startups, there are 2835 startups in Brazil. Sao Paulo, leads with 605 startups, followed by Minas Gerais with 181 and Rio de Janeiro with 125 companies. – The Brazilian internet audience is young on average, with 18% of users age 18-24 and 30% of all users age 25-34. (Source: comScore Media Metrix). – 60% of Brazilian residences lack internet access. (Source: Cetic.br ). – Household penetration was measured at 43% in urban zones and 10% in rural areas. (Source: Brazilian Internet Steering Committee (CGI.br). 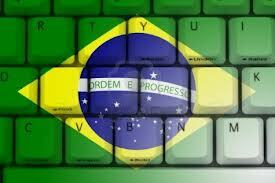 – In Brazil, 36% of online time is spent on social media, according to 2013 comScore stats. – Seventy-nine percent of Brazilian Internet users (some 78 million people) are now on social media, according to a newly released report from analysts eMarketer. – Brazil already counts 65 million Facebook users, second only to the U.S.
– Latin America’s largest economy is the world’s second-biggest user of Twitter (with 41.2 million tweeters and counting). – Google (YouTube) remains the king of online video in Brazil with an average of 83.8 videos watched per viewer in 2012. VEVO comes second. Brazil is also the largest market outside the U.S. for YouTube. -The number of videos viewed per viewer grew 18% in 2012, which accounts for an average of 129.3 videos/viewer. -Average time spent on Facebook among Brazilians increased 208 percent last year, to 535 minutes per month. By comparison, global use declined by 2 percent during the same period. -Digital advertising account for just 10.6 percent of the ad market, compared to 19.8 percent worldwide. By contrast, TV gets 69.4% of Brazilian ad dollars. – According to a MIT Study, in 2012 at least 50 firms made approximately 80 investments in start-ups in Brazil. R$1,7 billion (about USD 770 million) was the total that Brazilian startups raised last year. -Two regulatory bodies oversee Brazilian ICTs (Information Communications and Telecommunications ): ANATEL, viewed by some Brazilians as inefficient, and the Administrative Council for Economic Defense (CADE), an antitrust body that is perceived to be more effective in addressing complaints. – 100 million Brazilians are internet users and 61% of them have bought something online. -62% of Brazilians who bought something online are aged between 15 and 34. – The top three sectors that sold the most online were: Culture (26%), clothing (15%), technology (7%). – The average amount spent by Brazilians buying electronic items online was R$1263 (about $600) per purchase. According to a study by Nielsen, sponsored by Paypal, 5,3 million Brazilians spent R$2,6 billion (about $1.2 billion) in websites outside of Brazil from May 2012 to May 2013. – According to e-bit, Brazil’s ecommerce will grow 25% over 2012, adding up to R$28 billion. 100 million Brazilians are internet users and 61% of them have bought something online. 62% of Brazilians who bought something online are aged between 15 and 34. -Mercado Livre remains the top Retail property, reaching more than 14 million visitors in December. (Source: comScore Media Metrix). Optimistic foreigner tech entrepreneurs willing to move to Brazil should investigate Startup Brasil, a government program similar to Startup Chile that supports technology-oriented startups and attracst foreign talent. Startup Brazil will award 100 technology-based startups per year– including foreign-owned companies – an estimated total of US$ 20 million in public and private investment to develop their products and services. The first edition of Startup Brasil was launched early this year, selecting 56 tech companies and 12 incubators. Eike Batista, a Brazilian who was once the world’s seventh richest man and now is not even a billionaire, sold his 14.7% stake at IdeasNet, Brazil´s pioneer venture capital focused on tech, media and telecommunications startups. I don’t know if the fact that the biggest loser of the year has officially left Brazil’s startup scene serves as support for optimists or pessimists. Brazil still lacks extremely successful cases of tech entrepreneurs. In FORBES last World’s Billionaires List there were 46 Brazilian billionaires. The only one who made the bulk of his fortunes with technology was Eduardo Saverin, who became a billionaire thanks to Facebook. In fact, FORBES Brasil annual list of the Richest Brazilians reveals that over 33% of Brazilian billionaires come from traditional rich clans that control some of the country’s largest companies. Brazil´s startup scene scattered throughout the continental country that is home to 200 million people. There is not one singular region that can be considered Brazil´s Silicon Valley. Some people even believe that the next Jobs could be Brazilian.